By: Joshua Duhl, Senior Principal Product Manager for Oracle WebCenter Sites. Over the past few years, Digital Experience has tended to be a fast moving market. Driven by changing online consumer behavior, and fueled by key trends which include the demand for engaging mobile experiences that maximize efficiencies, simplification of multi-channel content management that support the reemergence of the brand site, and the personalization of individual digital experiences, it presents a challenge to marketers attempting to keep pace. Web Experience Management or WEM, the product category focused on the creation and management of digital experiences, is rapidly changing as well. WEM has grown out of simple web site management or web content management, to include personalization, social engagement, mobile engagement and support for multi-channel marketing experiences. Now more than ever before, marketers are increasingly and actively seeking WEM solutions that enable them to keep pace with the rapid evolution of digital marketing, and the relentless demand for engaging, and cross-channel digital experiences. 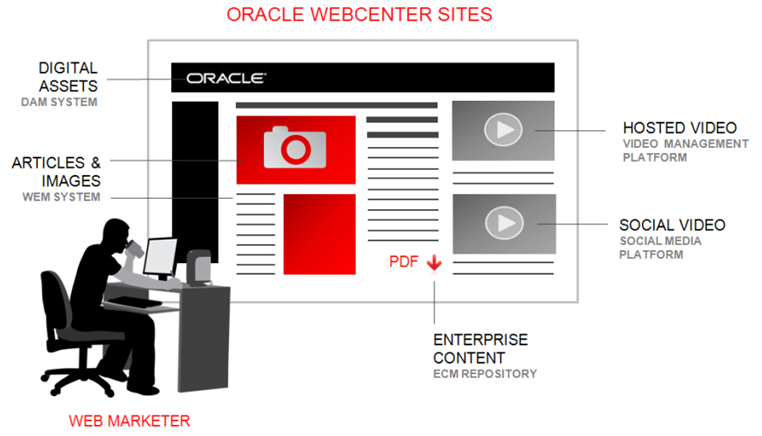 Oracle’s WebCenter Sites has long been a market leading WEM solution. With the release of WebCenter Sites 11.1.1.8, Oracle continues to expand the power and impact of WEM solutions, and keeps marketers in step with these key trends. Let’s take a look at how WebCenter Sites addresses them. The ability to manage and deliver engaging mobile experiences is currently the most pressing need we hear from our customers. Mobile site management is now seen as an integral part of managing their overall online experience, yet it comes with a distinct set of requirements that may need to be met separately, depending upon specific objectives. WebCenter Sites 11.1.1.8 new mobile site management option offers marketers the ability to manage their mobile sites with the same ease as managing their traditional online experience, while providing flexibility to deliver device-optimized sites as needed. By allowing content reuse, the utilization of the same tools and experience for site authoring and publishing processes across web and mobile, and by leveraging responsive design to reduce site development and speed time to market, marketing can maximize efficiencies for mobile site development, and deliver a consistent cross-device brand experience. In addition WebCenter Sites allows marketers to meet mobile-specific requirements when needed, providing mobile template and site plan customization, device management, and in-context preview and editing of mobile sites. It also enables full mobile content targeting, to drive personalized mobile experiences across any mobile device. 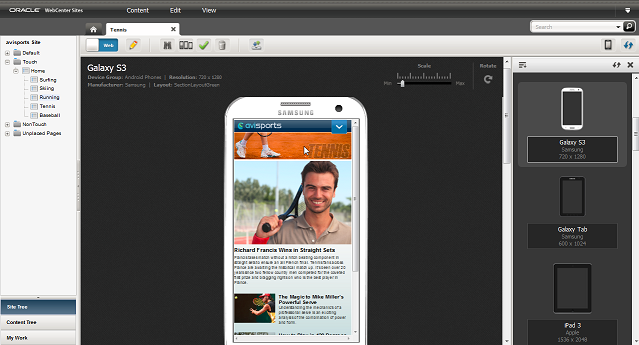 Mobile sites can be edited using drag-and-drop tools and previewed within the same business user interface as the traditional web presence. Over the past few years, consumers have turned the tables on brands, dictating how, when and where they want to experience the brand. As more online channels have emerged to meet this demand – from brand sites, to micro and multilingual sites, to email campaigns, through to mobile and social – the more complex content management has become for online marketers. What we’re seeing now is the reassertion of the importance of the brand site; the idea of the corporate .com as a center point of digital experience. The content that drives activity on other online touch points (email offers, social promotions, microsite landing pages) ultimately points back to the brand site, where all of these channels converge. In response to this trend, WebCenter Sites now enables marketers to search and access content originating from other channels such as YouTube, Brightcove and other cloud-based stores, or from enterprise content management systems, like WebCenter Content – in other words regardless of where it is stored – from within the WebCenter Sites authoring environment, and incorporate it within brand sites to produce a more unified, cross-channel experience. The Oracle WebCenter Sites visual contributor interface provides web marketers with an easy-to-use site authoring experience, aggregating content that can originate from a wide variety of sources . Of these, the latter two are of greatest interest to our customers. The ability to deliver engaging mobile experiences is in part dependent on delivering personalized, targeted content to specific mobile site visitors. Lastly, our customers are beginning to see the power of connecting WebCenter Sites native targeting engine to a predictive solution. It can offset the labor associated with managing segmenting and targeting through automation, while delivering higher success rates for metrics like click-throughs andconversions, or driving bottom line results like recommending higher margin items. We expect to see the most interest and growth in fully automated predictive system integrations in the coming year. The demands of digital experience continue to deepen and expand. Marketers need WEM solutions, like Oracle WebCenter Sites, that enable them to address the changing needs of their visitors, keep up with the rapid evolution of digital marketing, and meet the relentless demand for engaging, and cross-channel digital experiences. If you would like to see what Sites can do for your marketing team and customer experience, contact us today! This entry was posted on Thursday, August 29th, 2013 at 11:53 am and is filed under Oracle, WebCenter Content, WebCenter Sites. You can follow any responses to this entry through the RSS 2.0 feed. You can leave a response, or trackback from your own site.